Andy Peaks has laid down the gauntlet to his AFC Rushden & Diamonds players to see if they can go and beat one of the “big hitters” ahead of their clash with King’s Lynn Town at Hayden Road tomorrow (Saturday). The play-off picture in the Evo-Stik League South Premier Division Central is beginning to look a bit clearer with the majority of teams now having played the same number of matches. Diamonds currently sit five points off the top five and six behind the fourth-placed Linnets ahead of this weekend’s round of matches. 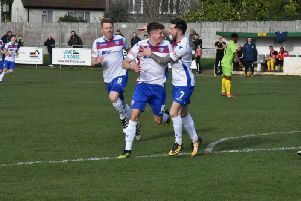 It’s been an impressive first campaign at Step 3 for Peaks and his players so far but the opportunity to force their way into the play-offs is still there and the manager is keen to grasp it. King’s Lynn were one of the pre-season favourites to win the title but a poor start has left them off the pace in the battle for the sole automatic promotion place. Diamonds were denied a win by a stoppage-time goal as the two teams drew 1-1 in the reverse fixture in October. And, having pushed the likes of King’s Lynn, Kettering Town and Stourbridge hard in their meetings with them this season, Peaks is now curious to see if he team can make the next step. “I am still pleased with where we are,” the Diamonds boss said. “Other teams have caught up with their games and I think the league makes proper reading now. “We know that if we can have a good second half of the season then we will be right there in thick of things. “We are looking forward to a massive test tomorrow. “We have played all of what you would call the big guns away from home and we have competed well. “But now I would like us to see if we can go and beat one of them. “We have a good squad of players and I think we are in with a shout of beating anyone in this league. But, if we are not at it, we know any side could beat us as well. “With the exception of Kettering and possibly Stourbridge, I think everyone is evenly matched. “Any team that goes on a good winning run will be right in there. I think it’s in the balance and we have the first big test this weekend. Diamonds’ clash at Rushall Olympic, which was postponed due to a frozen pitch last weekend, has now been re-arranged for Monday, March 11 (7.45pm).